Old Sleningford dates from the early nineteenth century. Originally, the estate was part of lands belonging to Fountains Abbey but after the Dissolution of the Monasteries in the Sixteenth Century, it became a separate estate, known as Skirbeck Hall (from the beck which runs through the grounds). It then passed through a number of different hands over the years until James and Juliet Ramsden inherited the estate in 1953. Their son and daughter-in-law, Tom and Jane now own the hall. 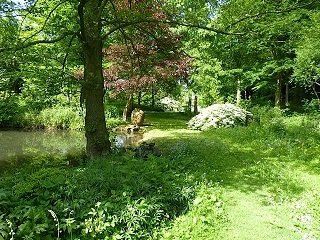 Old Sleningford is well known for its gardens which are open to the public as part of the National Garden Scheme and by appointment at other times. In 2019 the gardens are open on 1st and 2nd of June. Previous owners have added to the shape of the gardens over the years. In the early Nineteenth Century, General Kitchinman Hutchinson planted a beech wood and created a terrace walk, while his daughter, Miss Staveley, was responsible for the trompe-l'oeil decoration of the Summer House. The General also dammed the Skirbeck, to form a small lake with islands and a mill with its associated buildings. Later development of the garden was carried out by James and Juliet with the guidance, in the early days, of Brenda Colvin, "a distinguished figure in post-war garden design". More recently, the old stable block was converted into a studio area which hosts a regular series of art courses. This development was, in part, inspired by James and Juliet's daughter, Lottie, founder of the Leith School of Art in Edinburgh, who was tragically killed with her husband, Mark Cheverton, in a car accident in 1990. In addition to the gardens, the estate includes some 350 acres of working farmland.